Dr. Kenneth McKeever presents his talk entitled “Effects of a type-5 phosphodiesterase inhibitor on pulmonary artery pressure in race fit horses” in the Applied Physiology Drugs in Equine Sport Session of the 10th International Conference on Equine Exercise Physiology held in Lorne, Australia. Dr. McKeever is one of eight members of the International Committee of the International Conference on Equine Exercise Physiology (ICEEP) which holds a quadrennial meeting to present the recent advances in Equine Exercise Physiology. 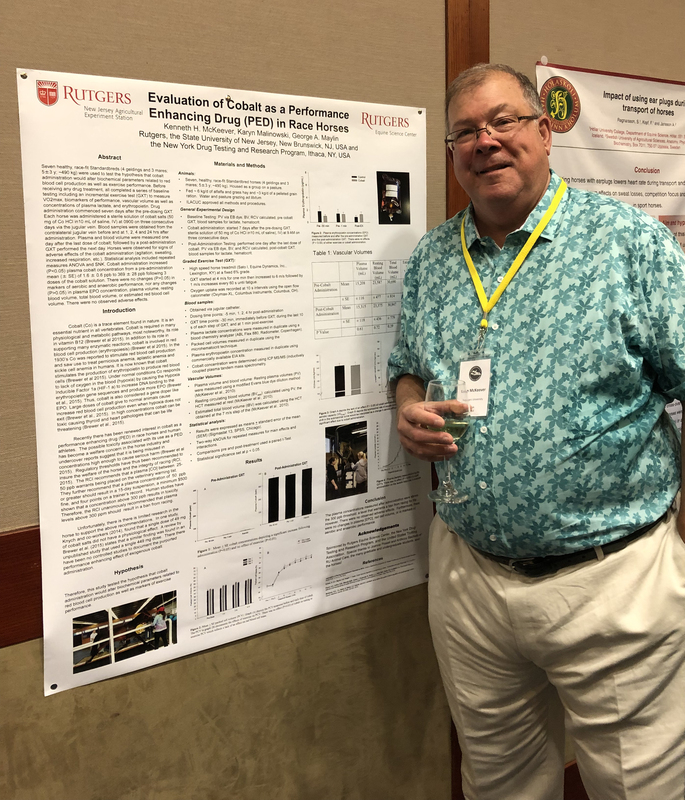 Dr. Kenneth McKeever presents his poster entitled “Evaluation of cobalt as a performance enhancing drug in fit Standardbred race horses” at the poster event held at the 10th International Conference on Equine Exercise Physiology. A five-minute summary slide presentation was also presented in the Applied Physiology Drugs in Equine Sport Session. ICEEP is the pre-eminent organization devoted to scientific research into the physiology, health, and function of equine athletes. Following ICEEP Dr. McKeever joined other International Committee members in Melbourne where they presented series of invited talks on behalf of Racing Victoria, the primary sponsor of ICEEPX. Dr. McKeever’s talk “Thermoregulation in Horses During Exercise” featured practical information for trainers and veterinarians who were attending the Melbourne Cup and the annual Victoria Racing Carnival. The next International Conference on Equine Exercise Physiology will be held in 2022 in Uppsala, Sweden.